My hubs and I are complete foodies. I would dine out seven days a week at posh restaurants if my wallet would allow me. For anyone that knows me, I ALWAYS order dessert. (Life is short people, get your sugar on!) My tried and true treat is Creme Brulee. If it's on the menu and nothing else tickles my fancy this is usually what you can find in front of me. 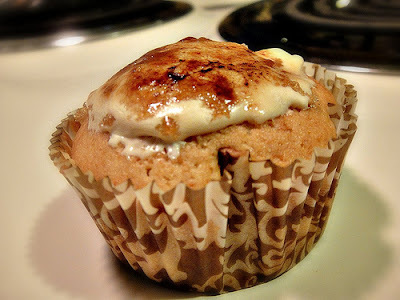 I have wanted to do a Creme Brulee cupcake for quite awhile now, but most of the recipes I found required a stand mixer to be handy which I didn't have at the time. I was finally able to tackle this recipe since my mother so kindly donated her Kitchen Aid to me. I found the recipe on Beantown Baker and was just floored by how cute the pictures looked. Mini creme brulees chillin' on top of a cupcake. How wicked awesome! The brown sugar swiss meringue buttercream turned out amazing. I could have bathed in this stuff. I brought these to work and people were coming back for seconds before lunchtime even hit. The cake is a little more on the dense side because you have to cone out the middle in order to "stuff" your cake with the buttercream, but nonetheless tasted delicious. 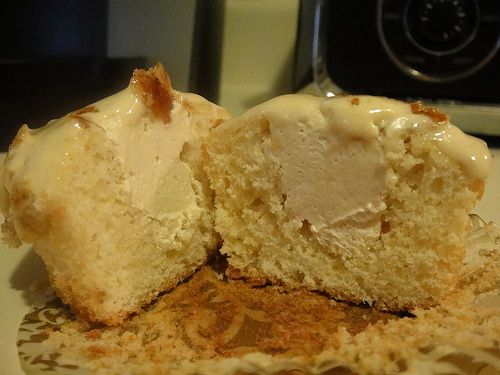 Here's how to make one delectable dessert in cupcake form..
4. Add egg yolks, one at a time, mixing well after each addition. Alternately beat in dry ingredients and milk. 5. Add caramel syrup and vanilla. Beat until smooth. 6. Beat egg whites with a pinch of salt until stiff but not dry. Gently fold the egg whites into the batter. 7. Spoon batter into cupcake papers that are in muffin pans, filling the cups about 2/3 full. 8. Bake 15-20 minutes, until a toothpick comes out clean when inserted in center of cupcake. Remove from over and cool completely. Put sugar, egg whites, and salt into the top of a double boiler over a pan of simmering water. Whisking constantly, cook until sugar has completely dissolved and mixture is warm (about 160 degrees). Pour heated egg whites into the bowl of an electric mixer fitted with the whisk attachment. Beat egg whites on high speed until it forms stiff but not dry peaks. Continue beating until fluffy and cooled, for a total of about 7 minutes. Switch to paddle attachment. With mixer on medium low, add butter two tablespoons at a time, beating well after each butter addition. Increase speed to medium high; continue beating until frosting appears thick, about 3 minutes or so. Reduce speed to low and continue beating for about 1 minute to reduce air bubbles. Remove center of the cupcake using the cone method. Fill cupcake with buttercream. Sprinkle brown sugar on top and caramelize with kitchen torch for the "creme brulee" look. Wow Tori! I had no idea you baked! I just started baking myself and I'm quite impressed with your desserts!